As the train departs from Montréal in the evening, you'll watch the sun set over fertile farmlands carpeting the southern shores of the St. Lawrence River and the Matapédia Valley. The Ocean covers hundreds of kilometres while you slumber so that upon waking, your eyes alight upon Chaleur Bay in all its misty, early-morning glory. After breakfast, you wander to the Park car to learn about lobster traps, ghost ships and Acadian traditions. 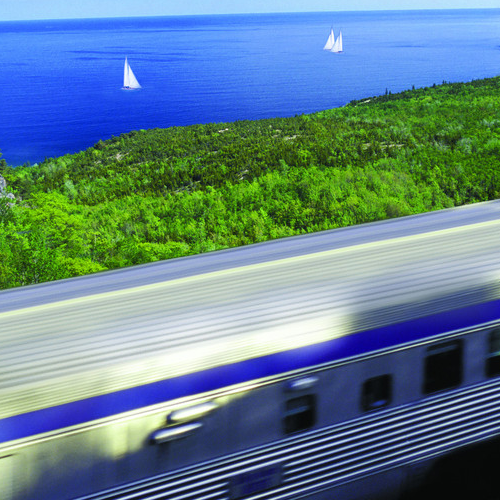 The Montréal-Halifax train makes an overnight journey along the St. Lawrence River before crossing the provinces of New Brunswick and Nova Scotia. Year round, choose the relaxing ambience and attentive service of budget travel in Economy class, or opt for Sleeper class for more cosy overnight accommodations. If you upgrade to Sleeper Touring class (available mid-June to mid-October), you'll also enjoy delicious meals included in the price of your ticket, exclusive access to the Park car and informal presentations and activities on the Maritimes. For more information or to book this or any other journey please do not hesitate to contact us.